What Are the First Friday and First Saturday Devotions? Have you ever heard the terms "First Friday" and "First Saturday" thrown around in Catholic circles, without knowing why there was something special about these particular days at the start of each month? The First Friday devotion and the First Saturday devotion are both reparatory devotions in the Catholic Church that arose from separate private revelations. 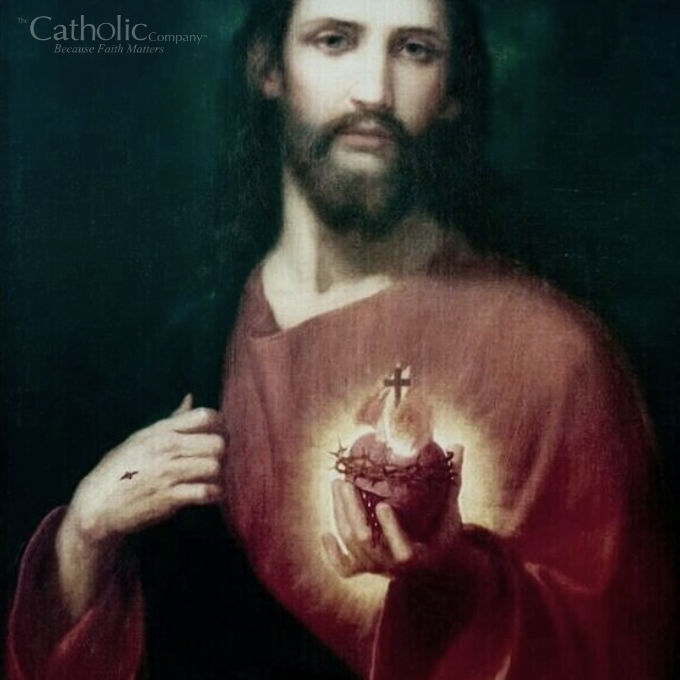 The First Friday devotion is associated with the Sacred Heart of Jesus, while the First Saturday devotion is associated with the Immaculate Heart of Mary. Incidentally, these are two of the most widely popular devotions to Jesus and Mary. Both devotions involve receiving Holy Communion on a certain number of consecutive first Fridays or first Saturdays of the month. You can think of it almost like a novena which is prayed on consecutive days for a particular intention, but instead, these devotions are performed on consecutive months for the particular intention of reparation to the Sacred Heart of Jesus and the Immaculate Heart of Mary, respectively. The devotions are similar in that they call on the faithful to "stand in the gap" by doing penance for sinners, and both give a special promise of Divine assistance at the hour of death, that is, the promise of dying in a state of grace and therefore obtaining heaven. Our Lord appeared to St. Margaret Mary Alocoque (1647-1690), a French nun in the Visitation Order, and gave her the special task to spread devotion to His Most Sacred Heart at a time when religion was growing cold in the hearts of mankind. "Behold this heart which, not withstanding the burning love for men with which it is consumed and exhausted, meets with no other return from most Christians than sacrilege, contempt, indifference and ingratitude, even in the sacrament of my love [the Eucharist]. But what pierces my heart most deeply is that I am subjected to these insults by persons especially consecrated to my service." Jesus asked for special prayers and practices to make amends (reparation) for this great neglect to the proper reverence owed to God. For those who did this faithfully, he made what St. Margaret Mary referred to as the "Great Promise" which was the last and greatest of the Twelve Promises of the Sacred Heart of Jesus. "I promise you in the unfath­omable mercy of my heart that my omnipotent love will procure the grace of final penitence for all those who receive communion on nine successive first Fridays of the month; they will not die in my disfavor [the grace of final repentance], or without having received the sacraments, since my divine heart will be their sure refuge in the last moments of their life." 1. Receive Holy Communion on nine consecutive first Fridays of the month (this assumes that the person is in a state of grace, having made a sacramental confession for any mortal sins prior to receiving communion). 2. Having the intention, at least implicitly, of making reparation to the Sacred Heart of Jesus for all the sinfulness and ingratitude of men. What a wonderful web site so informative and easy to understand Constantly looking for information about my faith as a Roman Catholic some things in the bible are for me hard to understand, but i'm driven for a need to be closer to Jesus and find peace in my heart. I have fulfilled the First Saturday Devotion on five consecutive first Saturdays. Is this devotion "designed" to be done as many times as one can or is fulfilling it one time enough? Candido - The devotion is meant to increase your fervor and deepen your relationship with God. Complete it as many or as few times as Jesus and Our Lady inspire you. Ashley Osmera I have another thing I would like to add here. I see in the comments your response to someone asking about praying to the saints and Mary. You're response was that you ask them to intercede and help in prayer. Only the Holy Spirit intercedes and helps in prayer. Please clarify what you mean because they are not helping in prayer and they shouldn't be asked to it is very misleading for this to be taught. It is not the same as asking someone who is alive to pray for you. They are not supposed to be asked for help in prayer that is in no way what it says in the bible and I feel like this is very sad that people are being taught this. Hi Syd, it is Catholic teaching that the saints are our intercessors in heaven. Christians have been praying to saints since the blood of the first martyrs were spilled, and many miracles have been wrought as a result which leads to that saint being canonized. Yes, asking the saints in heaven to pray for you is exactly the same as asking people on earth to pray for you, with the exception that praying to the saints is far more effective, because they are presently with God in heaven. It takes nothing away from the action of the Holy Spirit - it is the Holy Spirit who guides and directs all the interactions of the members of the Body of Christ. To learn more about this ancient Christian teaching you can refer to the Catechism of the Catholic Church: http://www.vatican.va/archive/ccc_css/archive/catechism/p123a9p5.htm. Please pray for my son with aspergers who left the church years ago as he said “it’s too much like school” and won’t sit through a mass. I am worried as he has not made his confirmation yet. He’s 21 now and won’t go back even to RCIA . I pray for him every day but I need him at Mass With me ! Thanks! Does a first Saturday have to follow a first Friday? Is it ok to go to confession once on one of the two days or does it have to be on both days? Hello Cheska - For the First Friday devotion, the article simply says you need to be in a state of grace, having made a sacramental confession for any mortal sins prior to receiving communion. For the First Saturday devotion, go to confession within eight days before or after the first Saturday. We recently have had a change in priests. Our former priest always lead the First Friday and Saturday service. Went to mass today and Father left after mass without doing the First Friday service. I was baffled but we always say the Divine Mercy Chaplet after mass, so we did that. But then a layperson started the First Friday devotion. So I guess a priest does not have to lead the First Friday or Saturday devotion? Our new priest is backing out of alot of what our former priest used to do. Sorta of hard for me. Hello! As far as I know, I don't believe there's a particular requirement for a priest to preside for the devotional prayers. I'm sure it was nice having a priest lead it before, but it may even be a positive thing that the priest isn't leading it currently, because it will give lay people an opportunity to step up to the plate and take a more active role in initiating and leading things in the parish. Just a thought. Prayers for you! I have been celebrating the First Friday and First Saturday devotions and recently connected these two special events with a subsequent 5-Day fast whereby I receive only the Holy Eucharist and water. The Rosary I pray consists of mediating on the mystery of each rosary bead instead of merely thinking solely on the overarching mystery of the decade. You will need to find a print out of each mystery and allow yourself to cogitate on each one. The approach is slower and offers a wonderful connection with Jesus and Mary. I have felt the Virgin Mary sit next to me while she kept me company as she requested us to do for Her. If you do the fast, then exercise prudence by educating yourself of its benefits and risks. There is not a lot of information you will find about fasting from Doctors however one reputable source is Dr. Jason Fung. The fast will cleanse and eradicate many problems in your life related to gluttony and lack of faith. Finally, it helps to do it with someone so that you can grow together. Awambeng Elizabeth - You may certainly start counting now. When I arrived for Mass (First Saturday Devotion), Father was out walking his dog! I was surprised to learn that the Mass had been cancelled because of an 11:00AM funeral. Do I have to start all over again? Henry - Just pick up again next month. So if September was supposed to be your 5th month, etc just start back up next month and have October be your 5th month. Our Lady sees your situation! Do most people participate in the devotions once a year? Do they generally stop going after the 9th one and then pick up again the following year or do they just start a new cycle of 9 after the last month finishes? Does it matter what month you start? As long as they are consecutive is it okay to start in September for example. And what happens if you miss one of the days due to illness? Can you make it up by going an extra day at the end? I'm sure no exact instructions were left explaining these questions but I was wondering what your opinion was. Hello Stacey! You can start with whichever month you wish. If you miss one due to illness, simply pick up with the next month and add one to the end. Our Lord and Our Lady see your desire and your intention to follow the devotion faithfully! Is it acceptable to pray the rosary and or the 15 minute meditation at home before Mass or must all the requirements be completed in order as in doing first the confession, Mass and Communion, Rosary then the 15 minute meditation? Hello! As far as I know all the requirements just have to be completed in the same day. Rosary before Mass is fine. I have a quick question about this. I've actually been going to the First Friday Mass for five or six months now since I heard about this, but I don't exactly understand entirely what it means to make reparation. I do the Chaplet of Divine Mercy every day along with some other things. Is that what is implied? Hello Katie! Good question. Reparation comes from the word "repair." When we sin, we ask for forgiveness, but we also repair what was broken because of the sin: if the sin was internal, maybe we make an extra sacrifice, say an extra prayer, etc for our own soul. If the sin was against someone else, maybe you need to ask for their forgiveness or make a practical repair of a situation. You can also "repair" or make reparation on someone else's behalf. For example, you can do penance or pray to make reparation for sins against the Blessed Sacrament, for the sins of clergy, for family, etc. This is what the First Friday devotion focuses on, and the divine mercy chaplet certainly has the same idea. Hope that helps. Thanks so much for the beautiful background on the devotions. I've been wanting to do this for a couple of years, but this was the nudge I needed. This might be a silly question, but is the first Saturday the first Saturday even if the actual first Friday isn't until the following week? For instance, September 1st is the first Saturday, but (obviously) the actual first Friday isn't until September 7th. Do I make attend mass on the 1st and the 7th? Hi Julia! That is definitely a legitimate question. The first Saturday devotion is on the very first Saturday, not the first Saturday after the first Friday. So the devotions may be "split" every once in a while. In this case it would be September 1st, not the 7th. So what about the fact that Jesus died on the cross for our sins and that we should not pray to anyone but him? How does that work when Catholics believe that you pray to Mary and other saints for forgiveness? I am Christian and believe in the holy trinity and the Bible and am not asking this for any other reason than understanding. Thank you ? Hello Andrea! Thank you for your question. We're glad you're searching for the truth! The proposition that Catholics pray TO Mary and the saints is actually a common misconception. We firmly believe that Christ is God, and that only God has the power to forgive sins. However, We ask Mary and the saints (whom we see as "older brothers and sisters in Christ" who have gone before us) to intercede for us to God. It is similar to the concept of asking friends on earth, or our earthly mom, to pray for us. We don't expect them to be the answer, and we certainly don't pray TO them! We just know that there is power in intercessory prayer, and that the graces of "two or three gathered in His name" for a specific intention or prayer are powerful! As to Mary, she is the mother of Jesus, and knew Him better than anyone else on earth. As the Mother of the Church, she always leads us to Her Son, to Jesus. She is a wonderful help and guide on this difficult path of life, just as our earthly mother is a often a special guide for us on earth. We hope this gives you some food for prayer, and invite you to read more of our blogs to learn more about the Catholic Church! God bless. So on the first friday devotion do we need to go to confession? Not specifically, BUT - "Receive Holy Communion on nine consecutive first Fridays of the month (this assumes that the person is in a state of grace, having made a sacramental confession for any mortal sins prior to receiving communion). I joined the Blue Army of Our Lady of Fatima in 1977. At that time I made the First Friday and First Saturday Devotions. Once you make them, they become part of your life. Now every First Friday and First Saturday I try to follow these in a spirit of reparation which is needed today. Thank you for these prayers online. This is so beautiful - thank you. I did the first five Saturdays. However, I realize now that I did not do the 15 minutes rosary meditation on any of those five Saturdays the way that Sister Lucia described it. What should I do? How. 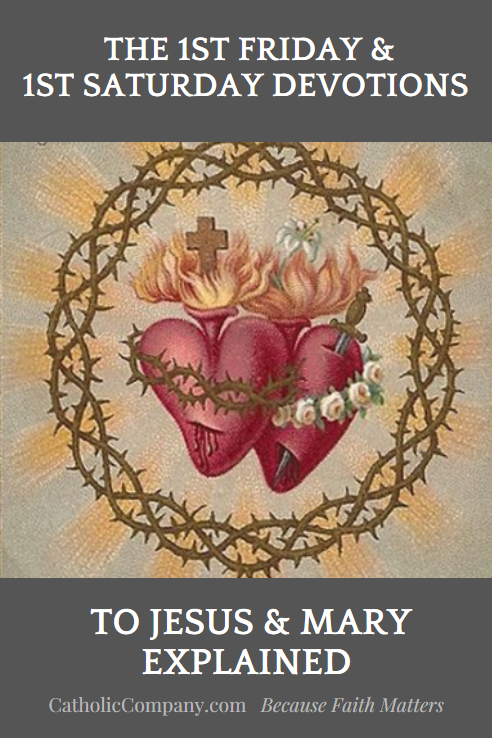 Can I obtain a copy of the image you have here of the Immaculate Heart. I would love to frame it. As long as I can remember, I have gone to First Friday Mass. However, reading your comments I have not always prayed for the reparation of my sins or the sins of the world. In fact, I only recently have been saying the rosary with the intended purpose of reparation. Question - now that I have been re-educated on both 1st Friday and First Saturday conditions, is it possible to retro-activate so to speak, all the Masses, Communions, Confessions I made FOR those specific times I went to Mass? It sounds like your general intention for reparation was sincere and intentional. No better time than now to simply start praying more intentionally for reparation of the sins of the world. Where can I find that picture of The Immaculate Heart of Mary that is pictured on this page? 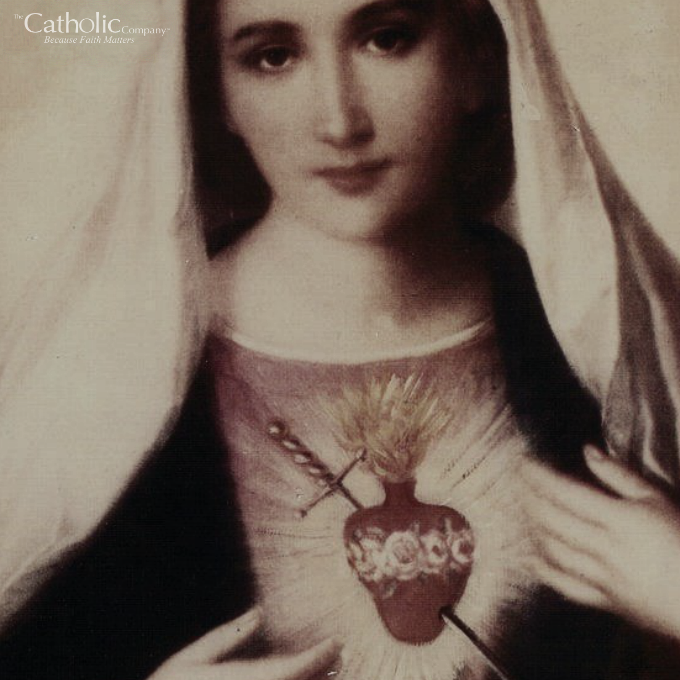 Hi Kevin, you can find our Immaculate Heart of Mary imagery that we have for sale here: https://www.catholiccompany.com/immaculate-heart-of-mary-c2820/.